The Silver Canadian Maple Leaf debuted from the Royal Canadian Mint in 1988. Introduced at the same time as the Platinum Maple Leaf, the coin made waves as the first major silver bullion coin with .9999 fine silver content. 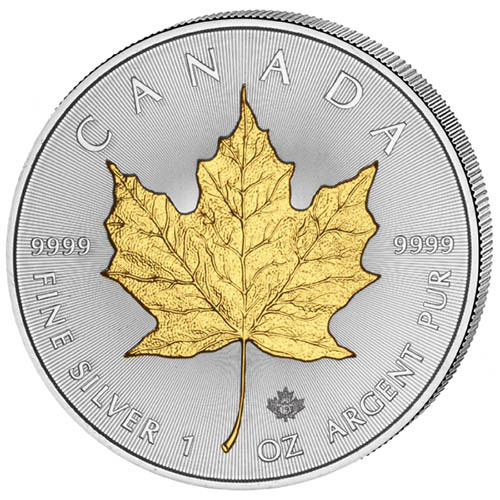 Right now, 2019 1 oz Silver Canadian Maple Leaf Coins are available to purchase online at Silver.com with a gilded finish. 32nd issue of Silver Maple Leaf coins! The reverse includes the sugar maple leaf design. Each of the individual 2019 1 oz Silver Canadian Maple Leaf Coins available here comes inside of a protective capsule. The coins are in Brilliant Uncirculated condition and have a distinctive application of 24-karat gold on the reverse design field. Known as a gilded finish, the coins have a thin layer of 24-karat gold applied to a particular design element. In the case of these particular coins, the gilded layer is applied only to the sugar maple leaf on the reverse side of the coin. The 24-karat gold is not prominent enough in quantity to adjust the value of the coin, but instead, adds visual contrast for the sugar maple leaf to set it apart from the silver background field. The reverse of 2019 1 oz Silver Canadian Maple Leaf Coins features the sugar maple leaf design from Walter Ott. Created in 1979 for the Gold Maple Leaf series, the image depicts the national emblem of Canada as it appears on the national flag and is used by countless government agencies and private entities. The Royal Canadian Mint’s radial lines and micro laser-engraved maple leaf privy are also featured on these coins. On the obverse of 2019 Silver Canadian Maple Leaf gilded coins is the right-profile portrait of Queen Elizabeth II. Her Majesty is featured in this fourth-generation portrait as created in 2003 by Susanna Blunt. 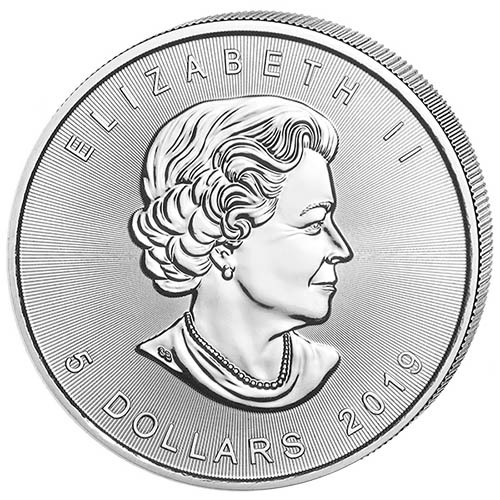 This portrait is unique in that it is the first Canadian coin design of the monarch to depict the ruler without a crown since Elizabeth II’s father King George VI. The Royal Canadian Mint is the original producer of all Silver Canadian Maple Leaf coins. The RCM operates two mints, the Ottawa Mint and Winnipeg Mint. The Ottawa Mint handles the production of all bullion coinage. If you have any questions as you buy silver, please feel free to reach out to Silver.com. Our customer service team is available at 888-989-7223, online using our live chat, and via our email address.